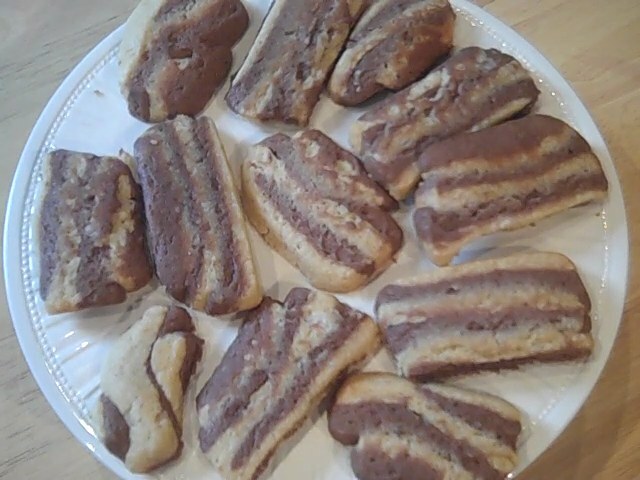 These rich, stripey shortbread biscuits are perfect with chocolate mousse or a cup of coffee. Melt the dark chocolate over a pan of hot water, remove from the pan then do the same with the white chocolate. Leave both bowl’s of melted chocolate to the side. Put the butter in a bowl and beat until creamy. Add the sugar and beat until pale and fluffy. Beat the egg with tha vanilla until just combined, then gradually beat into the butter mixture. Sift the flour, baking powder and salt into the bowl and using a wooden spoon or dough hook work in until thoroughly combined into a dough. Divide the dough in half and put one half in another bowl. Work the melted dark chocolate into one portion of the dough and the white chocolate into the other. Form the white chocolate dough into a brick-like shape and place between 2 sheets of clingfilm. Roll out to a 20 by 15cm rectangle. 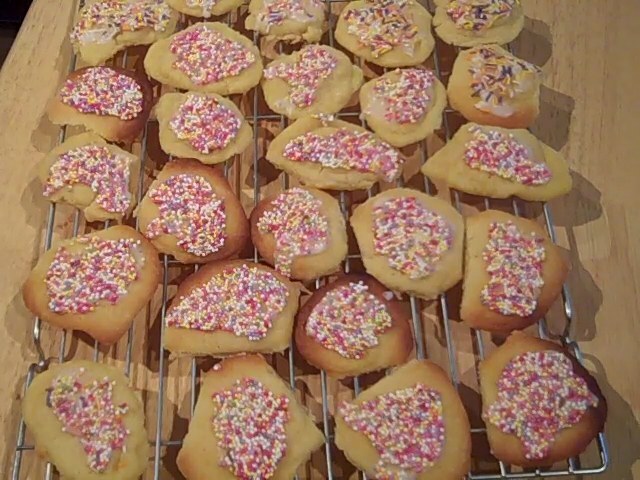 Slide onto a baking tray and chill for 30 minutes. Repeat with the dark chocolate dough. To assemble the biscuits put the white chocolate rectangle on your worktop. Peel off the top sheet of clingfilm. Peel off the top sheet of clingfilm from the dark chocolate rectangle and place it on top of the white chocolate dough. Gently press the two dough’s together. Peel off the uppermost sheet of clingfilm. Using a sharp knife, neaten up the rectangle so it’s exactly 20 by 15cm, then cut lengthway’s into 3 strips, each 20 by 5cm. Stack up the 3 strips to make a thin brick-like shape. Wrap in clingfilm and chill for 30 minutes. Preheat the oven to 180c/gas 4. Cut the dough brick across into 5mm slices and set them slightly apart on baking sheets. Bake for 10 – 12 minutes or until lightly brown on the edges. Remove from the oven and leave on the tray’s to firm up and cool, then transfer to a wire rack to cool completely. Store in an airtight container.